The DML file extension is associated with the Drillbench utility for Windows that allows engineers to modeling well drilling. The .dml file stores data in Drilling engineering markup language file format. 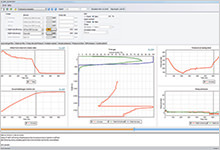 Drillbench is dynamic drilling simulation software for Microsoft Windows. Dynamic simulations are a key feature to replicate a real drilling operation and provide accuracy not possible with simpler steady-state models. Use Drillbench to open .dml Drillbench drilling engineering markup language files. Click on the tab below to simply browse between the application actions, to quickly get a list of recommended software, which is able to perform the specified software action, such as opening, editing or converting dml files. Programs supporting the exension dml on the main platforms Windows, Mac, Linux or mobile. Click on the link to get more information about Drillbench for open dml file action. Programs supporting the exension dml on the main platforms Windows, Mac, Linux or mobile. Click on the link to get more information about Drillbench for edit dml file action. Programs supporting the exension dml on the main platforms Windows, Mac, Linux or mobile. Click on the link to get more information about Drillbench for create dml file action.